Incremental gains in science are often made by standing on the shoulders of giants. Now that scientific advancement is increasingly dependent on complex data systems (the present-day giant), robust procedures are necessary to ensure that insights from data are not obscured from future scientists and real-time users. 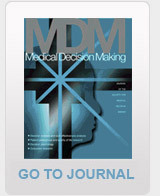 The Society for Medical Decision Making has a long history of developing methodologies which take advantage of complex data structures to enhance medical decision making and advance policy formation. The 2017 Annual Meeting will explore themes to ensure the credibility and usability of our Society’s efforts and to promote our vision of an integrated approach to health care decision making, through wise use and thoughtful communication of data.